I homeschool my three children so I always love to discover supplemental resources that are not only educational but fun too. 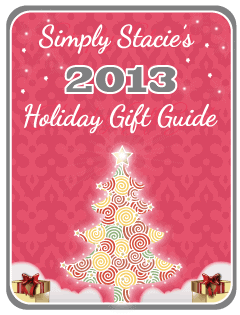 SmartLab Toys has a full collection of toys and books that would make excellent gift ideas for children of all ages. From science, art, bestselling toys and more there is sure to be the perfect gift idea for inquisitive kids on your holiday shopping list. My family loves science and there is nothing better to bring it to life than through science experiments. My boys literally jumped up and down with excitement when they discovered the That’s Gross Science Lab ($24.99). Providing hours of exploration into a “disgusting” world, this fun-filled science lab is packed with 26 super gross, wacky experiments such as “Foaming Flush”, “Snot Slime”, “Stink Bubbles (my personal favorite), “Potty Putty” and more. That’s Gross actually had my children begging to learn more about science so they could get their hands on these experiments. As their mom and primary educator, I appreciate that they are also being introduced to important scientific principles such as chemical reactions, polymers, diffusion and gas expansion. My seven year old daughter even commented that “science is so much fun…..” as she completed her favorite That’s Gross experiment. This award-winning, “Best Toy”, That’s Gross Science Lab comes complete with virtually everything you need to conduct each experiment i.e. 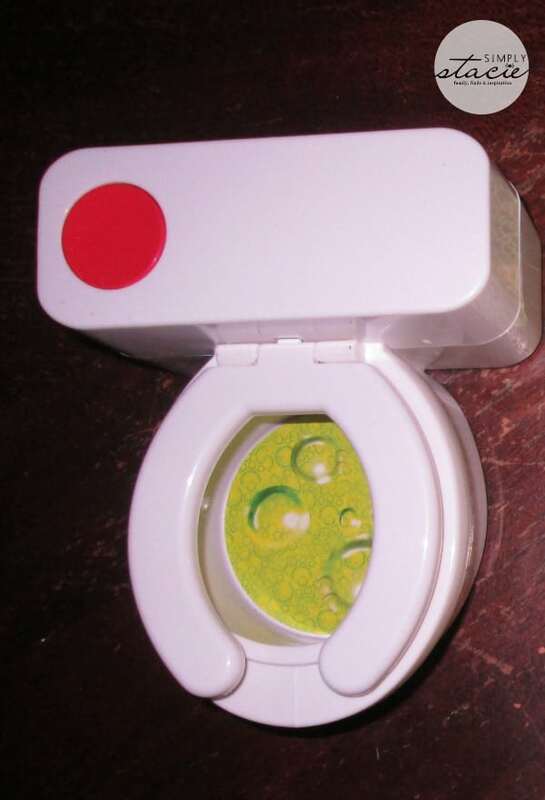 an actual motorized toilet bowl mixer with realistic flushing sounds, a garbage can shaker, ‘biohazard’ cup, a barf, maggot and centipede mold, worm spoon, bubble wand, funnel and 24 page full color book. I was very impressed with the SmartLab Toys instructional book that comes with this science kit because it vividly explains each experiment in detail, includes interesting facts and provides step by step instructions so that many of the experiments can be completed by the child independently with adult input as needed. 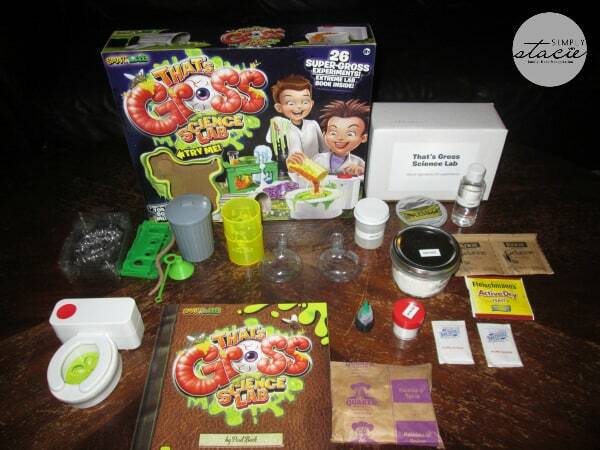 You get a lot for your money when you purchase the That’s Gross Science Lab and it is sure to be a hit this holiday season with children ages 8+ (my 6 and 7 year old children had no problem conducting these experiments with my help). There is a wide selection of wonderful gift ideas available at SmartLab including a few of our favorites such as the Glitter Art Set ($12.99), ReCon Programmable Robot ($69.99) which is my eldest son’s favorite robotic toy ever and the Mega Wild Animals 3-D Puzzles ($19.99). You are invited to visit SmartLab to browse the entire selection and find your own favorites! You can also check out the SmartLab Free Zone with tons of free downloadable activities for kids which would be perfect for holiday breaks and snow days! My autistic seven year old is fascinated with science, and he’d love just about everything from their science section. I’m going to get him the Secret Formula (http://www.smartlabtoys.com/secret-formula-lab.html) for Christmas! My grandson would love the Weird and Wacky Contraption Lab. The weird and wacky contraption lab is something my son would love. I want to see the All-Natural Spa Lab. Liked their You-Build-It Headphones. Maybe if my son’s could understand how headphones are put together, they might…. might take care of the ones I buy them. You can always hope. I would like to give the fashion studio set to my daughter. My daughter loves science. That’s Gross Science Lab would make a GREAT present for her! I like the fashion studio. I know my nieces would love it. I used to design outfits all the time when I was little. I like the fashion studio set. My granddaughters would love those Fashion sets in the Art kits. That’s a great company! I have a daughter that would love the fashion Studio, very well made and creative. My daughter and I would love the Hollywood Makeup Artist Studio! The Art Kit would help my granddaughter . She love to Draw and pink art would be wonderful ! would make a great gift for my son. Thanks. I would love to have the glow in the dark lab for my nephew! he is really into science right now! I love the All-Natural Spa Lab. Thank you for the wonderful giveaway! I like the ReCon 6.0 Programmable Rover. The Glow In The Dark Lab. The glow in the dark lab looks like a lot of fun! I like the Extreme Secret Formula Lab. That would be so cool! I would like to teach my kids about the human body with squishy human body. I like the demolition lab. Demolition Lab: Triple Blast Warehouse look fun. I would love to give the Hollywood Makeup Artist Studio to my daughter. The Weird & Wacky Contraption Lab is pretty cool for a gift.